For the first time in my postlife, one of my 21st-century works has been set into type and printed. A new poem, published under my own name, or at least under my own Twitter ID. How about that. An addition to the canon, without any need for contorted stylometric revisionism. The poem is in the Spring 2017 issue of the Shakespeare Oxford Fellowship newsletter, which is just out. Page 31. If you’re a member of the SOF, you can await your copy’s arrival in the post, or download the PDF. You’ll need the current member password to open the file. For every Stratford paper to inhearse? 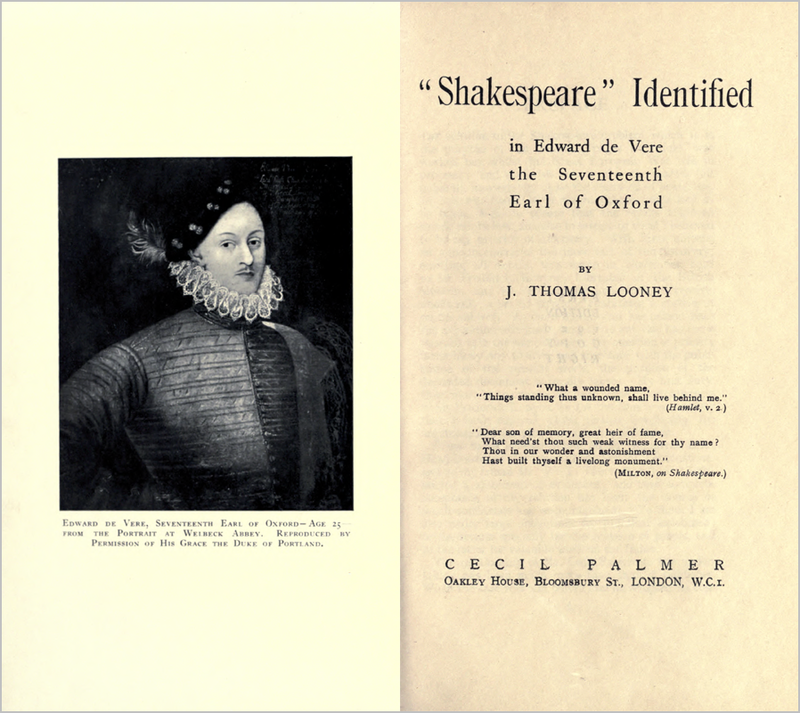 The year 2020 will mark the centennial anniversary of the publication of “Shakespeare” Identified, by J Thomas Looney. I’ve discussed this book before. Looney was the first to use a non‑predetermined comparison of lives versus works to dis‑cover my identity as Shake‑speare. His book served to simultaneously enlarge and focus the modern Authorship debate, in which we are still engaged today. Since “Shakespeare” Identified was so personally significant, I thought it fitting to limn a laudatory limerick in honour of its author. It then seemed appropriate to offer the poem to the SOF (thank you again Michael Delahoyde), and they accepted. Oh, the poem? If you want to see it in print you’ll have to join the SOF and get a copy of the newsletter, but here’s the blog-post version. Posted on 18 May 2017 20 March 2018 by @edevere17Posted in Announcements, Authorship (of Shakespeare), Books, Events, New Limericks, New Poetry, ShakespeareTagged "Shakespeare" Identified, AC/DC (band), J Thomas Looney, New Limericks, Poetry, Shakespeare Oxford Fellowship, Sonnet 38.